Over at Glitter n Sparkle this week, the challenge is to use real or faux stitching. I got this fab image to play with, from Sassy Studios...called Army Honey. The backing papers are all digi papers I have had a loong time. I've never had the chance to use it before, but knew it would be just right for with this image. deciding which sentiment I would have on it. something a bit different...and to fit with the image. Sassy's helmet, vest and pants are paper pieced. hair is coloured with watercolour pencils. I drew on the faux stitching. Love everything about this, Vic! This is so beautiful card! Thanks to joining us at The Crazy Challenge! You did a great job with this image and card. Thanks for joining in with us at MSC this time. Great card. Hi Vic! That's a really great sentiment. We all need to push ourselves past our limits and this card is a great inspiration. Thanks so much for stopping by to share your time and talents with us. I really hope that you will stop by again soon. I'd love to see more of your lovely work. Have a blessed week! Beautiful card! Thanks for sharing this with us at My Sheri Crafts. What a wonderful unusual card Vic - your paper piecing is just amazing, and I really love the sentiment, so fitting. Thank you so much for entering this one into the OSAAT challenge this week. Great card, I love the image and your DP! Thanks for playing in our "Stitching - Faux or Real" Challenge #83! 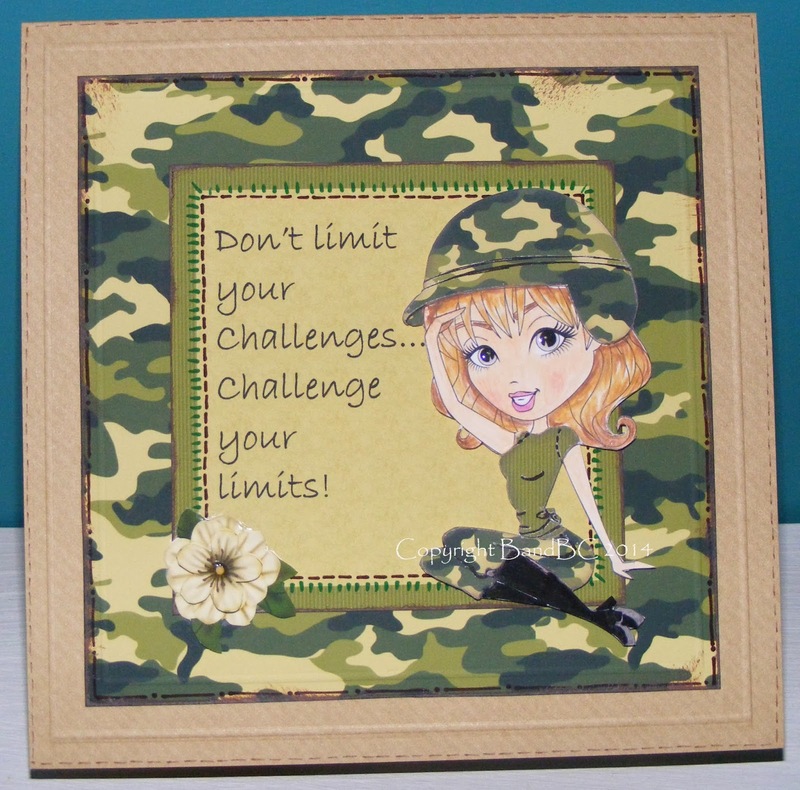 Having connection with our military through my own son and lovely niece I am sure you could not have created this very special birthday card with a more fitting sentiment Viv .... good advice for we civilians but exactly what is expected of our brave young people who commit to The Services. I love your image and your paper piecing is stunning. Oh you have put so much thought and skills into this wonderful card. What a great card. Love that sassy image. Your paper piecing is great too. Thanks for joining us this week at One Stitch at a Time. Good luck. Thanks for playing with us this week at One Stitch At A Time. Good luck. Thank you for playing along with us this week at TPC with your gorgeous creation. Such a special card! Great paper piecing! Great sentiment and I love the DP!! Excellent paper piecing too, works perfectly. Thanks for joining the One Stitch At A Time challenge this week, hope to see you again soon. What a fun card, Thanks for joining us at Patties Creations Challenge Blog for our challenge of Stitching, dont forget to check back later to see what our new challenge is. Love how you have matched up the paper with the image. Lovely card! Thanks for joining us at Milk Coffee ! Such a gorgeous image - I made 2! !